At last, businesses can rely on an alternative financing solution without the bank hurtles. The Lendinero business line of credit will help business owners obtain this type of financing with minimal documentation. Lendinero, is a leading online provider of working capital financing to small businesses, is gaining traction by offering business lines of credit. The Lendinero business line of credit program offers companies a line of credit between $5,000 to $150,000. In fact, Lendinero began providing this product on February of 2018 and has originated over $5 Million from small businesses who prefer a business line of credit as oppose to a daily payment loan. Undoubtedly, the process is fast and simple. Business owners only need to provide the last 4 months of bank statements, a business utility bill, a voided check and a valid U.S identification to get a credit decision. In truth, this a true business line of credit. In comparison to banks, the process is easier. The available credit replenishes as a business repays their outstanding funds. This allows the business to draw additional funds anytime, on-demand. Of course, interest rates are low ranging from 8% to 25%, depending on the creditworthiness of the borrower and the business. At this time, payments can be made weekly or monthly over a 6 month or 12-month period. 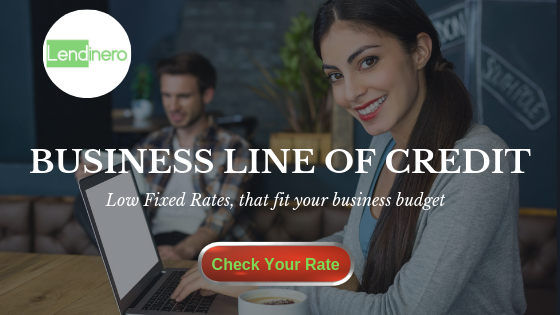 Furthermore, when the time frame expires the business owner can obtain a new credit line. In conclusion, since launching this program thousands of small businesses can obtain a viable financing solution. In any event, businesses can use the funds to purchase inventory, cover expenses or expand operations. Obtaining a business line of credit with Lendinero is much easier than a obtaining one from a bank.